Japanese Climber Junko Tabei, First Woman To Conquer Mount Everest, Dies At 77 : The Two-Way "We were told we should be raising children instead," Junko Tabei said of the all-female expedition she helped lead on Everest in 1975. Junko Tabei survived an avalanche and defied society's expectations to conquer Mount Everest in 1975. 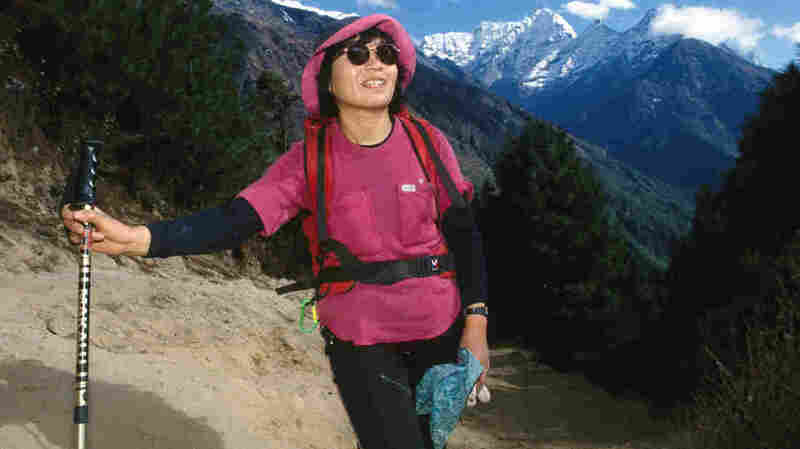 More than 40 years after she became the first woman to climb the world's highest mountain, Junko Tabei has died at age 77, according to Japanese media. Tabei was just 4'9", but she was a giant in mountaineering, as the first woman to conquer the "Seven Summits" — the tallest peak on each continent. Tabei "was diagnosed with cancer 4 years ago but continued her mountaineering activities while undergoing treatment," Japanese broadcaster NHK reports, adding that she died Thursday in a hospital in Kawagoe City. In 1975, an avalanche and a harrowing ascent on Everest weren't enough to stop Tabei; cultural pressures weren't, either. Even before she confronted the world's tallest peak, Tabei had already defied Japanese society's ideas of how women should behave by leaving her 3-year-old daughter with her husband and heading to Nepal to tackle Everest. Just six years earlier, she had founded the Ladies Climbing Club (slogan: "Let's go on an overseas expedition by ourselves."). Her all-female climbing club was a first in Japan; Tabei started it in part because of how she was treated by male climbers. "Back in 1970s Japan, it was still widely considered that men were the ones to work outside and women would stay at home," Tabei told the Japan Times in 2012. "Even women who had jobs — they were asked just to serve tea. So it was unthinkable for them to be promoted in their workplaces." The expedition Tabei helped lead on Everest was made entirely of women (not including six Sherpas). She also helped find sponsorship — although in many cases, "We were told we should be raising children instead," she said in 2012. Tabei's passion for climbing took root when she was 10, after one of her teachers took a group of students on a climbing trip. She did so despite worries about her health — "I was stamped as a weak child," she told Sports Illustrated back in 1996. In that same article, Tabei also described how her love for climbing led to a willingness to stick out — to be "the nail that sticks out" in the Japanese proverb, "The nail that sticks out will be hammered down." After she finished the Seven Summits in 1992, Tabei set her sights on more mountains. 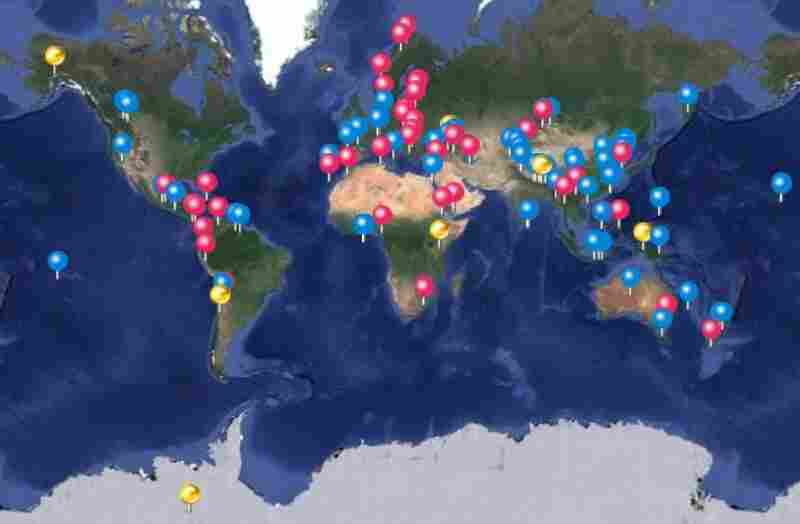 A map of her successful climbs includes dozens of expeditions around the world. But she maintained close ties with Everest, advocating for sustainability in mountaineering on that and other summits. A map created by Junko Tabei's personal website shows the locations of dozens of her climbs. Tabei reached Mount Everest's summit after an avalanche hit her team as they slept in tents at Camp II, 21,326 feet above sea level. The rush of snow knocked her unconscious, but didn't stop the expedition. Another nasty surprise awaited closer to the peak, when Tabei was astounded to realize she needed to traverse an icy knife-edge ridge, moving sideways with half her body on the Chinese side of the mountain and the other half on the Nepalese side. "I had no idea I would have to face that, even though I'd read all the accounts of previous expeditions," Tabei told the Japan Times four years ago. "I got so angry at the previous climbers who hadn't warned me about that knife-edge traverse in their expedition records." Tabei downplayed her achievement — "I was the 36th person to climb Everest," she told Sports Illustrated. Talking about Everest and her willingness to be different, Tabei smiled when she told the Japan Times in 2012, "There was never a question in my mind that I wanted to climb that mountain, no matter what other people said."